Build the circuit below and remember to be very careful about how you attach the wires so that no unsheathed wires touch accidentally. Pay attention to the flat mark on the LED to see that it is closest to the ground. 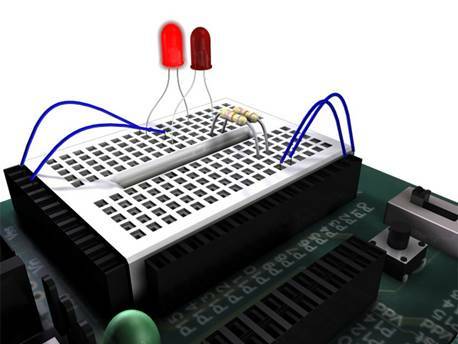 Notice that a single wire going from the ground plane (VSS) to the breadboard will define a complete row as ground so that both LEDs will then be connected to ground. Railroad: 'The label at the start of the program. Note ‘The colon after the name railroad. 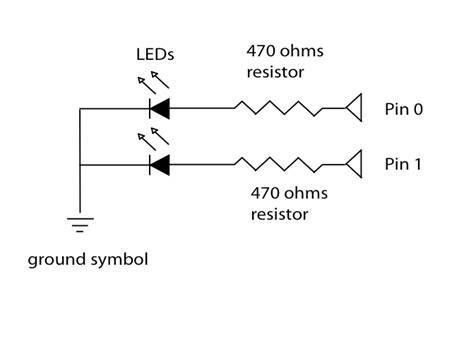 Notice on the schematic how you can attach both wires coming from the LEDs into a single common ground plane. Notice how there is an arrow coming from pin 0 and pin 1 and this indicates you are driving an output from your Basic Stamp 2. Enter the program below and hit run. Does the program work? If not proceed to the section at the back of this chapter on debugging. Change the timing of the lights to change the flashing of the LEDs by changing the pause cycle. Make one flash at twice the rate of the other. Program one LED to flash once for every four flashes of the other LED. Using multiple HIGHs and LOWs, program your LEDs to start flashing slowly and then gradually increase their rate.